The climax for the Portuguese season has finally arrived (or has it? Let's keep in mind that FC Porto have yet to play third-placed Paços de Ferreira away). Last night's match had everything fans from one side or the other from the barricade and the neutral football buffs could want: Intensity, uncertainty about the result, some undercover dirty tricks and a goal in the dying moments. In a match that was under the scrutiny of many people worldwide - since it was the last tittle race still going in Europe's major leagues -, FC Porto and Benfica participated in a hard-fought battle for the Portugal's most important title that must have attracted numerous fans the world over. While FC Porto coach Vítor Pereira went with his expected side, his counterpart chose not to include Cardozo this time around, favouring Ola John instead and playing Lima as the furthest forward and Nico Gaitán just off him. At the moment this text was written, it was not clear whether the decision was of a strategic sort (to keep FC Porto from overrunning their opponents) or whether it had to do with the Paraguayan's fitness (Benfica are, of course, playing Chelsea next Wednesday for the Europa League trophy and every detail is crucial). FC Porto came pressing hard right out of the gates, aware that the result was theirs to chase (nothing but a victory would be goo enough). Even though Benfica did not press up high, they had clear instructions to obstruct every passing lane for the Dragons, which worked for most of the match, the odd play notwithstanding. In fact, this was for the most part "um jogo de pares" (literal translation "a game of pairs"), as the Portuguese expression goes. Enzo kept an eye on Moutinho, Gaitán was in charge of tracking Fernando and Matic had Lucho in his area of influence. With the starting 15 minutes gone, FC Porto were smothering Benfica, but with no clear-cut chance to show for it. The Eagles, in turn, were forced to resort to a more direct brand of football with Lima as the target, often to no avail. The Dragons found it easy to circumvent Benfica's mild pressing up front by making Fernando drop back in between the centre-backs, bypassing Lima and Gaitán. However, and even though they often found James in favourable positions down the centre, Vítor Pereira's men were not able to provide through-balls, particularly because there was no one willing to run in behind the Benfica defence. As he often did throughout the season, Lucho González drifted to the wings, for two reasons: Firstly, to clear up space in the middle for James Rodríguez and secondly to allow for overload down the wings. Despite managing to invade Benfica's "block" (to borrow an expression from AVB's book), FC Porto were not making their opponents pay for it. Benfica scored the first goal on 19 minutes following Sálvio's throw-in, an all too similar play to Cardozo's goal against Fenerbahce at Estádio da Luz. Benfica would always look dangerous from that sort of set-pieces, with FC Porto looking unprepared for it. While Jorge Jesus' charges had hardly done anything to deserve the lead, they were comfortable enough (as Jesus' teams always are) to take the most of free-kicks, corners and throw-ins. Despite conceding a goal five minutes later somewhat fortuitously, Benfica really came into their own after scoring, finally finding their passing groove, with Matic, Enzo and Gaitán the fulcrum around which the team revolved. Gaitán's work rate, in particular, has to be highlighted in face of the usual criticism he often receives for his lack of consistency. His persistence while tracking Fernando was enough to throw a spanner into FC Porto's works and disturb their passing rhythm, while continuing to provide Benfica's out-ball. The first half would end with the home team giving it their all, but Benfica still looking in charge. FC Porto started the second half in the same fashion they had done in the first period - pressing hard and trying to stifle Benfica's initiative. For the first few minutes, it worked, but, as time went by, Benfica looked more and more sure of themselves, confidence growing as the minutes elapsed. The Dragons started following their own crowd towards a chippier match, giving way to greater risks and more transitions, something that played right into Benfica's hands and harmed FC Porto's possession-based approach. James left the centre permanently in the second half, with the right-back Danilo providing the width on the right wing and Varela down the left. 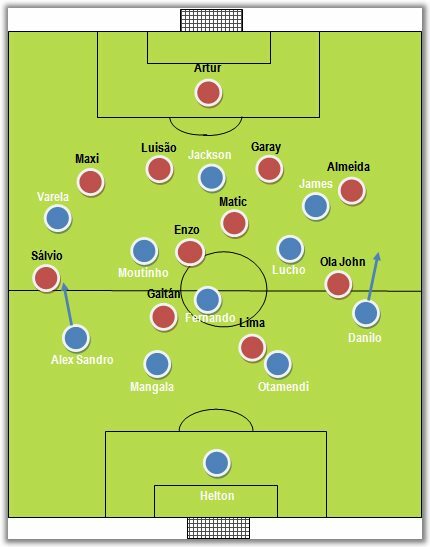 There were times where FC Porto's positioning (if not the fluidity) reminded Barcelona's, with Danilo (a la Dani Alves) high up and Alex Sandro further back and tucked in. As the match wore on, Benfica's assertiveness contrasted well with their opponent's anxiety, with even Otamendi occasionally storming forward in open play - still with no clear-cut chances to show for the dominance. The last 15 minutes were a succession of fouls and time-wasting, with both teams incapable of getting something more out of the match. In that particular respect, Mangala's impetuosity proved once again costly, with several unnecessary fouls at a time when that was hardly necessary. FC Porto then desperately reverted to a rare 4x4x2, with Liedson alongside Jackson Martínez and Kelvin down the left wing. It would end up being the young Brazilian prodigy who would end up scoring a decisive goal in the dying moments of the match. This match will certainly go down in history as one of the most memorable Clássicos in the Portuguese league. Even though FC Porto were fortunate about the way they found their way to victory, it is likely safe to say that it was a fair reward for a team that gave it their all, well supported by their fans. As for Benfica, the defeat will cast some shadows over Jorge Jesus and Benfica's accomplishments, namely in this particular match. The last-minute goal will no doubt have Benfica fans complaining about their coach's tendency to design new solutions for big matches, but a distanced analysis will prove that Benfica were quite close from getting what they went to the Dragão for, clearly due to Benfica coach's strategy and planning - as the scanty amount of opportunities for FC Porto testifies.